The first bonus offer highlight of the week is similar to ones we have seen for other airlines. 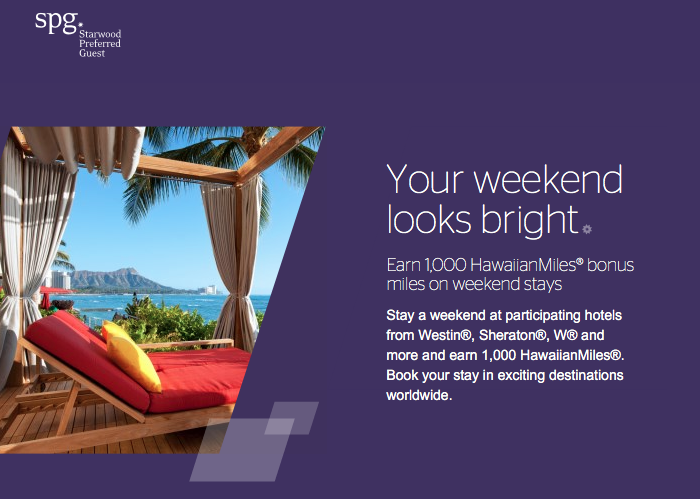 The offer is for 1,000 bonus HawaiianMiles when completing a weekend stay at participating Starwood Hotels Worldwide. The similar offers are from programs like Aeroplan, AAdvantage and Rapid Rewards. This is a great bonus if SPG isn’t a major program in your loyalty portfolio and don’t stay at Starwood Hotels very often. Other bonuses added today that you should also check out are American AAdvantage’s 4x miles for Alamo rentals, Accor Hotels’ Triple Points in Asia Pacific offer and Preferred Hotels Double Points in Ireland promotion.